Looking to decorate your room with a budget? This simple DIY will help you with that. Since I already had the paints I wanted to use.. I only spent $5 on the frames and lace. All materials together were about $22. 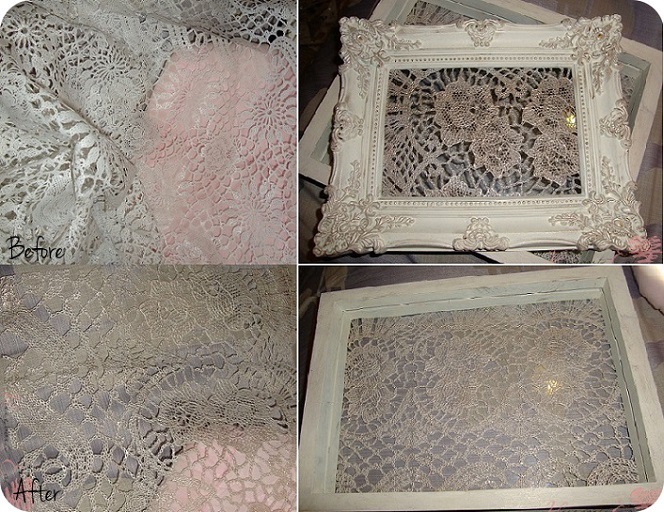 It was well worth it because I have a lot of lace and paint left over to use on other projects. I had this space above my vanity empty and it looked very odd to me. I took the mirror from my vanity and placed it on my wall after decorating it. Shortly after, I headed to my local dollar tree and .99 cents store and grabbed a few frames. They didn't have any frames I liked and the colors were hideous but I figured I would be able to embellish them. Keep reading to see how I did. Paint: Color(s) of your choice. Regular paint or spray paint. If you go to the paint section at home depot there is usually a cart with paint on top. Those paint cans are usually 30%-50% off. That's where I grab my paint for projects. They have various sizes and colors but it's very limited and varies. The paints they place there are usually from the days before by customers that change their minds after the staff makes the paint. Before you begin be sure you are using an open space. If you are using spray paint I recommend doing this outside. 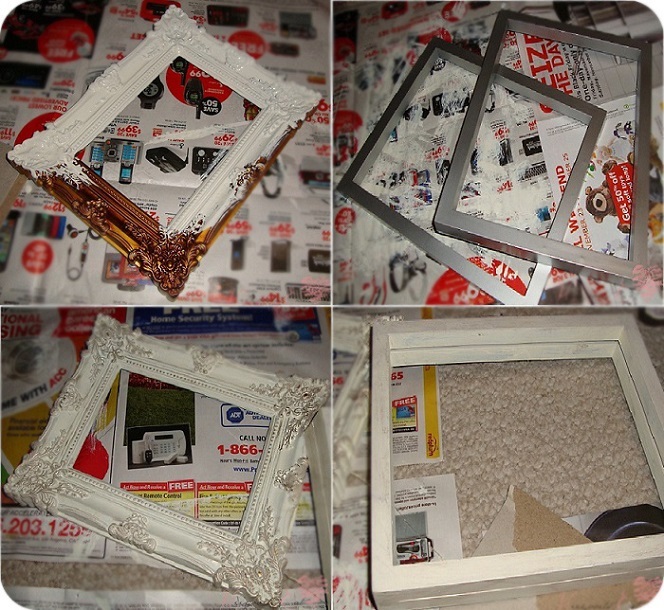 Also, make sure to place newspaper under the frames while you paint them. You can see below that the detailed frame was a dirty bronze type color. I really liked the detailing on the frame because it was exactly what I was looking for but the color threw me off. I decided to paint it white and lightly brushed Martha Stewart's Vintage Gold paint over the details. I went ahead and glued the lace pattern on the back of the frame and glued the glass from the frame behind the lace. For the display box I painted the two silver frames white, let it dry completely then took sand paper (an old nail filer you don't use anymore would do) to sand the edges a bit. Sanding the edges and lightly brushing some of the Vintage Gold paint on the sides and edges gave it a vintage/shabby chic look as well. After everything completely dried I took glued one of the frames on top of the other. Just like the previous frame, I went ahead and glued the lace pattern on the back of the frame and glued the glass from the frame behind the lace. I loved the Vintage Gold paint so much that I decided to paint the lace with it. It looks so much better and goes well with the frames. I also went ahead and painted the top of the frame with the Vintage Gold then the Champagne glitter paint. Took a few coats and longer to dry but completely worth it. You can use the Champagne glitter paint on it's own but it would take more coats depending on how much glitter you wanted on your project. I love how everything came out. The colors and lace I chose adds something extra to my room without making it too girly. The box is also great for me to display my favorite polishes of the moment for easy grab. Sometimes I even switch it out with my favorite lip products. This is how I decorated my mirror before painting it with vintage gold + the glitter paint. 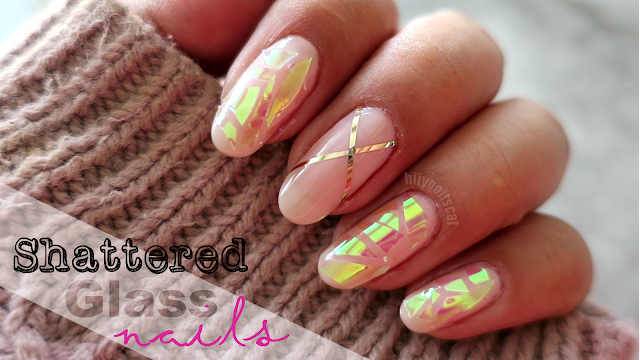 You can layer another plain frame on top if you wanted it deeper but if you're hanging it make sure you use the proper nail size. I love the box because I get to change out what I display on it anytime I want to. I usually don't put anything on the other frame because I think it looks great as it is. I love writing stuff on my mirror! I use to have "You're only beautiful if you believe", I like this quote because no matter how many people compliments you, you won't have confidence in yourself unless you believe in yourself. It pretty much helped with self-esteem & confidence. I currently have "She believed she could, so she did and you can too", the original quote doesn't contain the 'and you can too' I decided to add that to remind myself that I can do anything I want to if I believe I can. I love this quote because you can apply it to anything you want. So what are some of your favorite quotes or sayings? Share in the comments section below! I am always looking for new sayings to write on my mirror. Tea Time // Procrastinating Beauty Blogger TAG! Daiso Haul // Pink Overload!